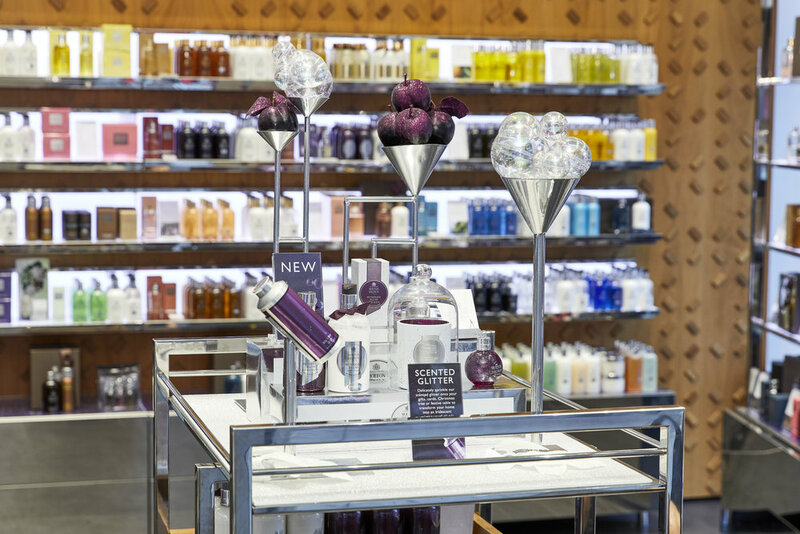 This festive season, Molton Brown have taken their customers on a decadent and opulent journey with their intoxicating Christmas product launch, Muddled Plum. Challenged with bringing to life the heart notes of their new fragrance; Victoria plums and oak barrel aged dark rum, Sarah Feather Design designed and realised the ‘Muddled Plum Distillery’ for all UK and global Molton Brown store windows. Elements of the Muddled Plum Distillery were extended in-store to champion the festive product range and Advent Calendar, across all global stores and concessions. Each element, entirely bespoke to this scheme, has been hand crafted and finished by Sarah Feather Design, including glittered and lit hanging foliage, handmade wooden branded barrels, decorative artificial bubbles and plums, and chrome finished metalwork. For the Flagship treatment, a magical Muddled Plum distillery in the snowy forest was enhanced with moving parts and synchronised lighting.